Page revised in September 2017. 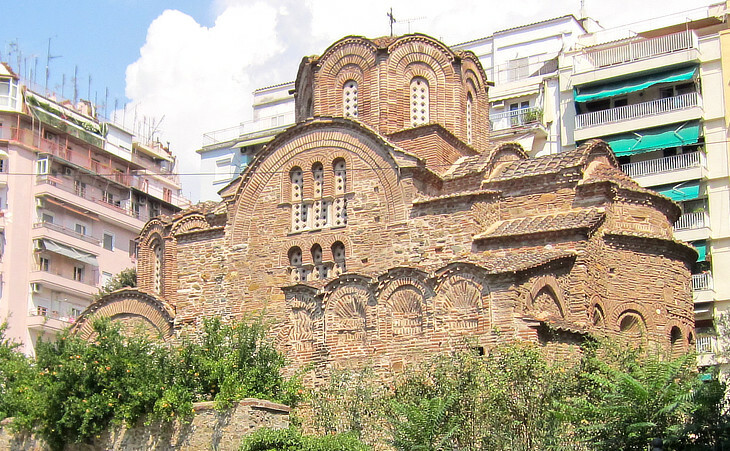 The passage of Thessalonica from the Roman to the Byzantine era was marked in 390 by the massacre of 7,000 of its citizens in the hippodrome; this was the punishment decreed by Emperor Theodosius for riots against the Goth commander to whom he had assigned control of the city. In 392 Theodosius issued a series of decrees to actually implement a 380 edict which declared the Christian faith (in its Nicene creed) the sole religion of the Roman Empire; the emperor had to face the hostility of many members of the army who were followers of Sol Invictus, a monotheist belief centred around the god Sun. This may explain why so many military saints are recorded among the martyrs; their hagiographies were widely "advertised" by the clergy in order to wear down the initial attitude of the army. 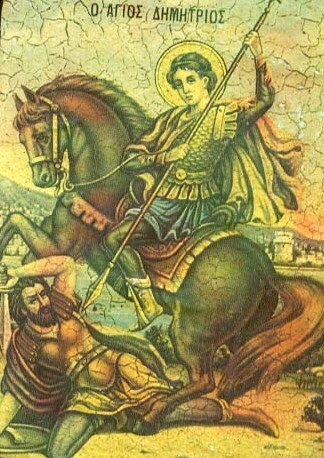 According to tradition Demetrius of Thessalonica was killed during the persecution ordered by Emperor Diocletian. 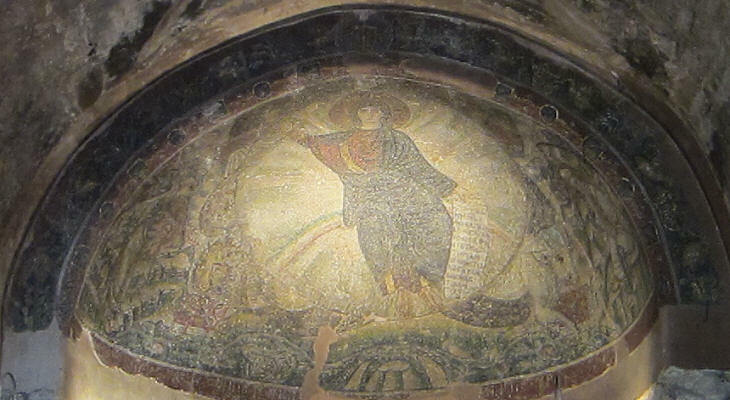 A large church was dedicated to him as early as the Vth century in the centre of the ancient city. In 1917 a fire badly damaged the building, in particular its front part. 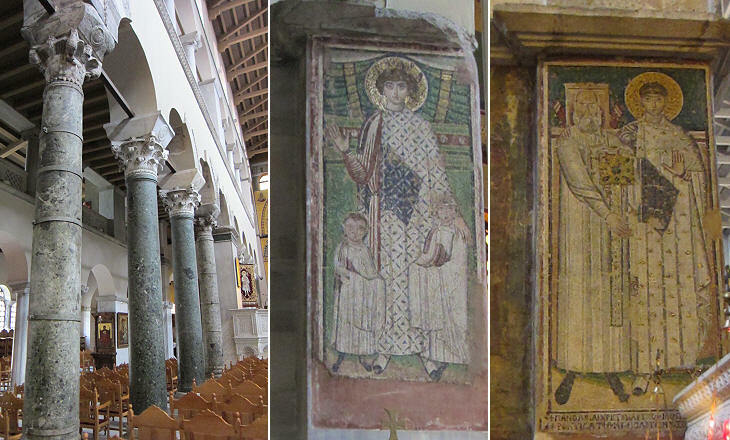 Demetrius is portrayed in a series of small VIIth century mosaics on the pillars near the apse; they show a young man in elegant civilian clothes, typical of the upper classes; this iconography is in contrast to the prevailing one which portrays the saint as a cavalryman in the act of killing the gladiator who executed him - it opens in another window. 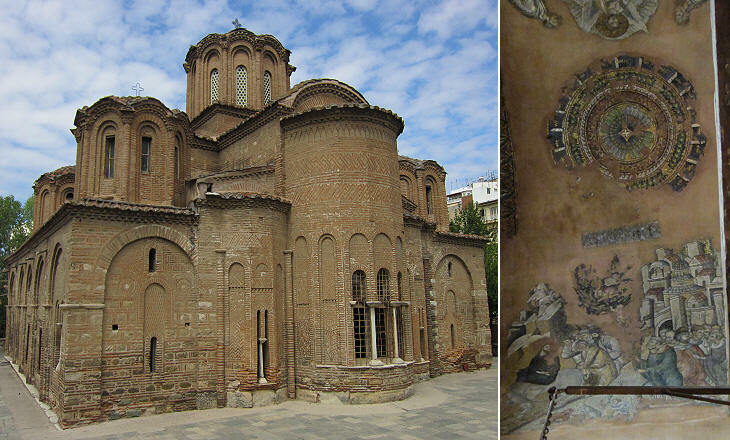 In 1430 Thessalonica was conquered by the Ottomans, but Agios Dimitrios remained a church until 1491 when it was turned into a mosque and a minaret was built to the side of the façade; the mosaics were covered with plaster, but they were not vandalized; the same applied to the 1481 tomb of Loukas Spandounis, a rare example of Italian art outside Venetian territories in Greece; members of the Spandounis family lived in Venice and they commissioned this monument for their relative in Thessalonica; it is attributed to the workshop of Pietro Lombardo, a sculptor of many tombs in Venice and the architect of S. Maria dei Miracoli in Venice and S. Maria Assunta at Cividale. Osios David is a small and very old church in the upper part of the city which is dedicated to a local saint who delivered his speeches from a tree (a story very similar to that of St. Simeon); according to tradition the church was built by Theodosia, daughter of Emperor Maximinus; she was killed by her father when he discovered she was a Christian. 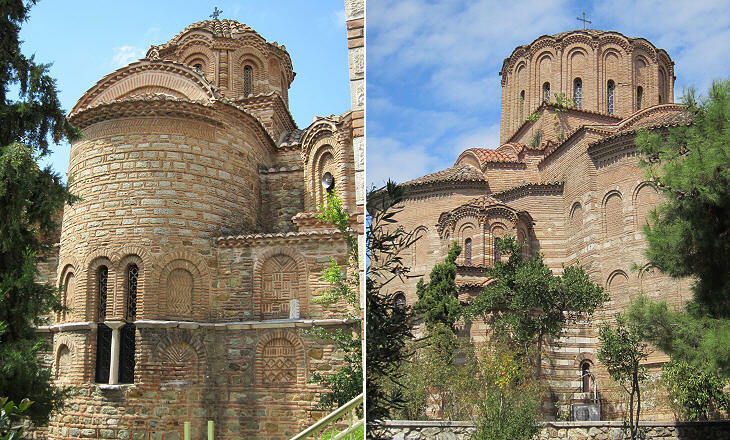 Similar to Constantinople's Agia Sophia this church is characterized by a large shallow dome; its design shows the passage from three-aisled basilicas to Greek cross churches. 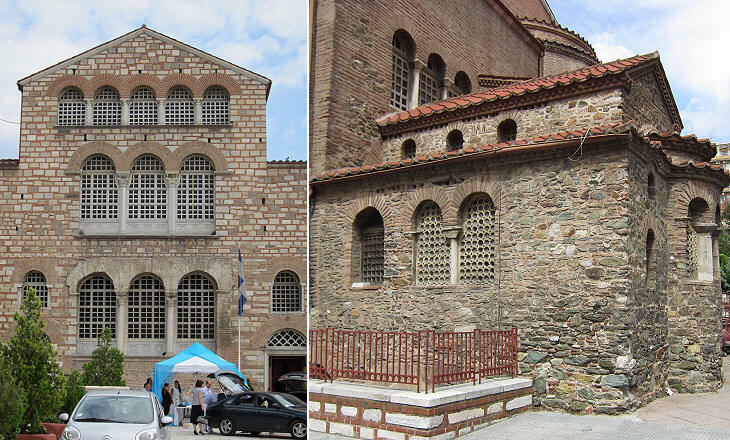 Agia Sophia was converted into a mosque in 1585, many years after the Ottoman conquest of Thessalonica; this may be due to the fact that it was located in the part of the city which was mainly inhabited by Christians. 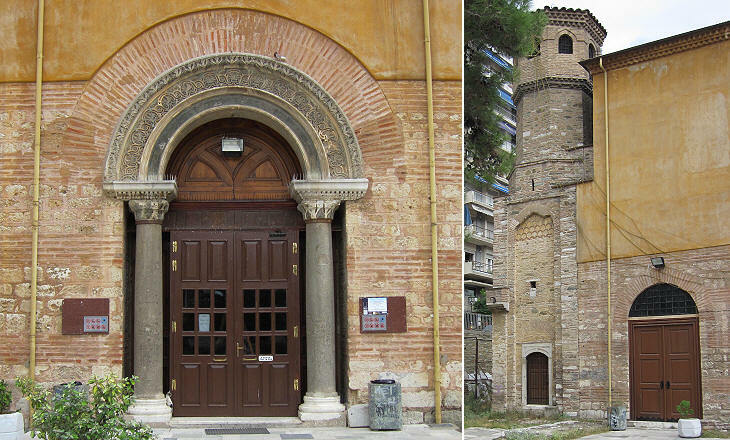 Panagia Halkeon means Our Lady of the Smiths; Halkeon is the Greek translation of the Ottoman name of the mosque which was given because the building was located near the blacksmiths' stalls in the nearby central market; it is not therefore the church of a guild; it shows a typical Byzantine design and it was built at a time when the decline of the Empire was reversed by the Comnenos dynasty (you may wish to see some churches built by the Comnenos in Constantinople). In 1204 the crusaders conquered Constantinople and partitioned among their leaders some territories of the empire, while others remained in Byzantine hands; Boniface of Montferrat became King of Thessalonica; his kingdom however did not last for a long time; in 1224 the city was conquered by the Byzantine Despot of Epirus; in 1246 Thessalonica passed to the emperors of Nicaea, who in 1261 re-conquered Constantinople. The final period of the Byzantine Empire (1261-1453) was marked by a development of the arts which was promoted by the Palaeologus dynasty; buildings are characterized by an elaborate brickwork and are decorated with paintings which show the influence of Italian art; the image shown in the background of this page is based on a fresco of Dodeka Apostolos (you may wish to see the frescoes of St. Saviour in Chora in Constantinople). 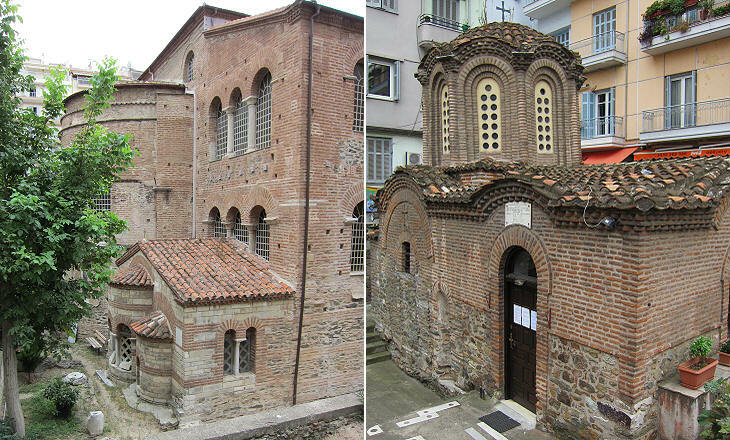 The construction of many churches in the last years of the Byzantine Empire was also due to the importance of the city as a centre of theological controversies; St. Gregory Palamas, Archbishop of Thessalonica, promoted the practice of continuous prayer in solitude and retirement to achieve knowledge of God (Hesichasm meaning stillness, quiet). 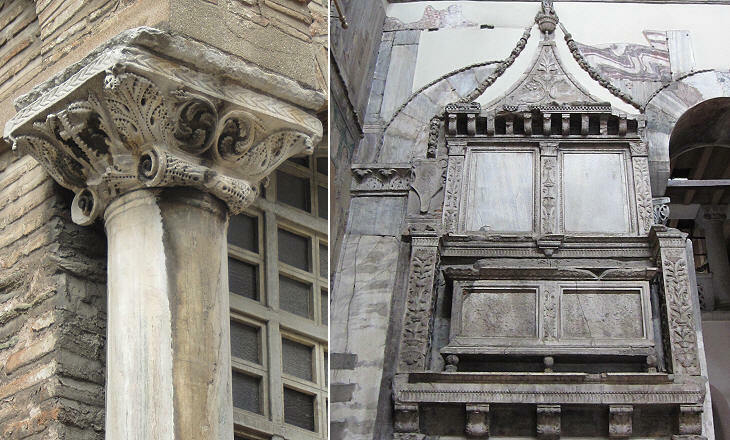 You may wish to see churches of this period at Constantinople. 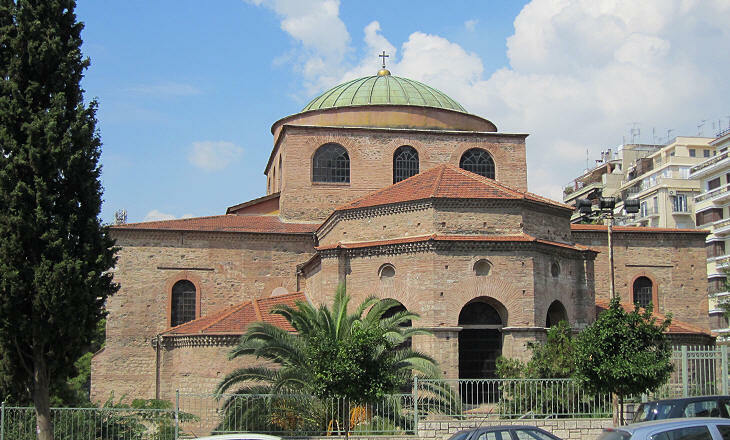 In 1349 the Serbs occupied Thessalonica; the Palaeologi managed to conquer the city back, but they did so only with the help of Ottoman troops; in the following years the Ottomans established their first bridgehead in Europe and started a policy of expansion in the Balkans. At the beginning of the XVth century Constantinople was surrounded by Ottoman territories and had increasing difficulties in keeping its remaining Greek possessions; in 1424 Emperor Manuel II sold Thessalonica to Venice; this move alarmed the Ottomans who regarded the Venetians as a much more formidable opponent than the Byzantines; in 1430, when Venice was at war with Milan, Sultan Murad II conquered Thessalonica. 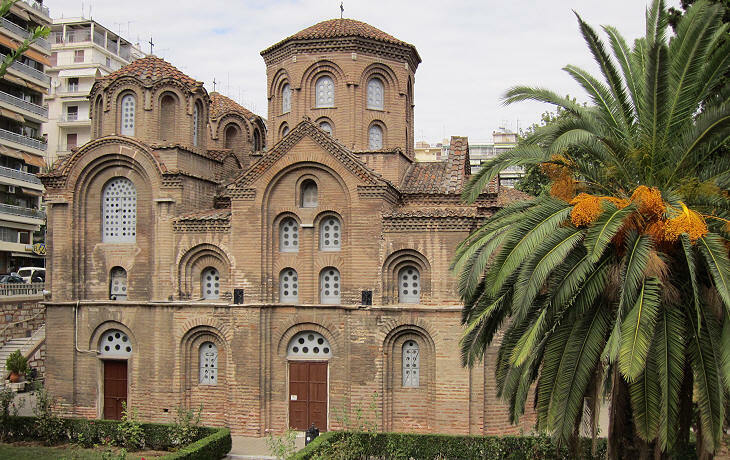 Return to Roman Thessalonica or move to Ottoman Thessalonica.